You might have seen the Hug-a-Hunter or Hug-an-Angler ads on TV or social media over the past year. Through both messaging and humor, the campaign aims to highlight that hunters and anglers contribute to conservation. One ad starts by explaining that when someone buys a hunting license, some of that money goes to conservation, like restoring forests and protecting wildlife. "The money from hunting licenses pays to conserve Colorado so even if you don't hunt, chances are you still love hunting," the narrator says. The ad ends with a group hug between a family of hikers and a very confused hunter. The Colorado Wildlife Council, the group behind the ads, has found that the campaign’s message is resonating. Its most recent statewide survey shows that Coloradans are more aware of the connection between license fees and wildlife management. About 6 in 10 responded said they support hunting, and about 8 in 10 said they support fishing. But some people who don’t hunt or fish, especially in urban areas, still have negative attitudes about those activities. 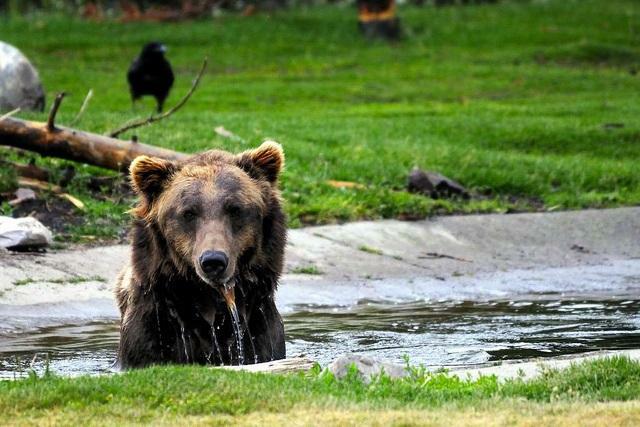 A federal judge has extended a temporary ban on grizzly bear hunting near Yellowstone National Park while he mulls the animal’s fate. Click 'play' to hear the audio version of this story. Bears, some of them with young cubs, are starting to emerge from hibernation along Colorado’s Rocky Mountains. As they do, there’s a risk they will be killed or have to be euthanized -- something that’s been happening more frequently. According to the most recent data provided to KUNC, 2,484 bears were killed between 2011 and 2015 by means other than licensed hunting. That’s almost a 75 percent increase over the previous five-year period. Colorado could be the next state to allow hunters to wear florescent pink. A Democratic proposal to give hunters the option of wearing pink – in addition to the traditional safety orange – has passed the Republican controlled Senate Agriculture, Natural Resources and Energy Committee. "I hunt because it's a treasured time with my dad and my brothers," said Senator Kerry Donovan (D-Vail), a big game hunter and sponsor of Senate Bill 68 [.pdf]. "And the stories that happen in hunting camp are the stories that my family tell over and over again." For the first time, pronghorn hunting will be allowed in the Soapstone Prairie Natural Area north of Fort Collins. Six doe pronghorn permits will be offered by lottery until the end of February. Officials estimate there are over 3,000 pronghorn in the area.